Children love learning languages, and multiple studies show the benefits of raising a bilingual or multilingual child: stronger neural pathway development, higher test scores, and better problem solving abilities are just some of the proven results. Finding bilingual books in French, Spanish, Hindi, and Swahili can be hard, so we have gathered many of the best bilingual children's books together in one place for you. 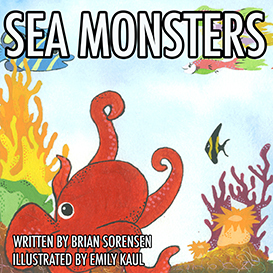 We have bilingual books in over 50 languages�and our own publication, Sea Monsters, the hit new bi-lingual coloring book which will soon be available in over 100 languages. Do you like Harry Potter, Tin Tin, and The Little Prince? You will find these books in many languages at Multilingual Books. You can also see cartoons (including Harry Potter) in Portuguese, German, and 25 other languages by visiting our Multilingual Cartoon Blog! There once was a duck who had the bad luck to live with a lazy farmer. While the duck worked, the farmer lay in bed - until one day the other animals decided to take action! Winner of the Smarties Book Prize for 1991. Available in English with: Albanian, Arabic, Bengali, Bulgarian, Chinese-Traditional, Chinese-Simplified, Farsi, French, German, Greek, Gujarati, Hindi, Italian, Japanese, Korean, Kurdish, Malayalam, Nepali, Panjabi, Polish, Portuguese, Romanian, Russian, Somali, Spanish, Tagalog, Tamil, Turkish, Urdu, Vietnamese, Yoruba. Ages: 2-7; Paperback. A perfect introduction to traditional fables. In the first clever fable, Fox invites Crane to tea but gives her a flat dish so she can't eat any food. When it is Crane's turn to invite Fox, what dish does she use? In the second Chinese fable, King of the Jungle, Tiger thinks he is the king of the jungle but can Fox fool him to save his own skin? Available in English with: Albanian, Arabic, Bengali, Bulgarian, Chinese-Traditional, Chinese-Simplified, Croatian, Farsi, French, German, Greek, Gujarati, Hindi, Irish, Italian, Japanese, Korean, Kurdish, Panjabi, Polish, Portuguese, Romanian, Russian, Scottish Gaelic, Somali, Spanish, Swahili, Tagalog, Tamil, Turkish, Twi, Urdu, Vietnamese, Yoruba. Ages: 4-9; Paperback. Winner of The Sainsbury's Book Award 2002! A brilliant board book for babies, toddlers and their parents to enjoy together. A great introduction to books through a well known nursery song and interactive text. Available in English with: Arabic, Albanian, Bengali, Chinese, Farsi, French, Gujarati, Irish, Korean, Panjabi, Polish, Portuguese, Somali, Spanish, Tagalog, Tamil, Turkish, Urdu, Vietnamese. Ages: 0-3; Board Book. Guaranteed to enrich a toddler�s vocabulary, this simple and fun series of bilingual board books is ideal for helping children discover a foreign language. Titles in the series feature numbers, colors, animals, fruit, home, and vegetables. This collection combines photographs, bright illustrations, and dual-language words in clear, bold text. Suitable for both individuals and groups, these books are a child�s perfect introduction to exploring other languages. Part of Milet�s new board book series, My First Bilingual Book � Colors features a two-page spread on each featured colour, with a large image on the right and four smaller images on the left of objects in that color. The images are photographs embellished with illustration, so they are fresh and creative but still simple and clear. Below each image is the word for the object in English and the second language in large, bold text. Children can explore the concept of colors while they learn the words for objects around them in two languages. The book is ideal for home as well as classroom and can be enjoyed by children on their own or in groups. Featuring a sturdy board book format, My First Bilingual Book is an enjoyable and educational bilingual resource for young children. A long time ago on a cold night in Arabia, Ali Baba noticed something very strange as he gathered firewood in the light of the full moon. A rumbling sound, like thunder, came not from the sky but from beneath the earth.. Richard Holland's brilliant use of collage captures the essence of this classic tale. Great story for exploring folktales from around the world. 32 pages full colour. Available in English with: Arabic, Albanian, Bengali, Bulgarian, Chinese-Traditional, Chinese-Simplified, Croatian, Farsi, French, German, Greek, Gujarati, Hindi, Italian, Kurdish, Panjabi, Polish, Portuguese, Romanian, Russian, Shona, Somali, Spanish, Swahili, Tamil, Turkish, Urdu, Vietnamese. Ages: 5-9; Paperback and Hardback (depends on language). Exuberantly colored artwork and favorite animals make this rhythmic story the perfect introduction to looking at and learning about colors. Another classic by Eric Carle. "The gentle rhyming and gorgeous, tissue paper collage illustrations in this classic picture book make it a dog eared favorite on many children's bookshelves. Available in English with: Albanian, Arabic, Bengali, Chinese-Traditional, Farsi, Gujarati, Hindi, Kurdish, Panjabi, Portuguese, Shona, Somali, Tamil, Turkish, Urdu, Vietnamese, Yoruba. Ages: 1-6; Paperback. In this famous Bengali story, an old woman travels through the forest to meet her daughter. On her way she meets a fox, a tiger and a lion - and they all want to eat her! Buri tells them to wait until she returns, when she'll be nice and fat. When it is time to go home, her daughter thinks of a plan to outwit the tiger and the lion. But will the fox be fooled? Available in English with: Albanian, Arabic, Bengali, Chinese-Traditional, Farsi, French, Gujarati, Panjabi, Polish, Somali, Spanish, Tamil, Turkish, Urdu, Vietnamese. Ages: 3-7; Paperback. It's the worst Diwali ever! Dad has forgotten the sparklers, the fairy-lights are broken and, after hearing the story of Rama and Sita, Deepak is sure that Ravana the demon king is after him. Part of our "Celebration" series, this warm contemporary story is interwoven with beautifully illustrated images from Hindu mythology. The book is packed with recipes and activities. Available in English with: Arabic, Bengali, French, Gujarati, Hindi, Malayalam, Nepali, Panjabi, Polish, Tamil and Urdu. Ages: 3-8; Paperback. Read Ellie's secret diary to see how she coped with bullying. Help is at hand! Nominated by the Educational Resources Awards as the Best Primary School Book. Available in English with: Albanian, Arabic, Bengali, Bulgarian, Chinese, Chinese-Simplified, Croatian, Farsi, French, German, Gujarati, Hindi, Italian, Japanese, Korean, Kurdish, Panjabi, Polish, Portuguese, Romanian, Russian, Shona, Somali, Spanish, Swahili, Tamil, Turkish, Urdu, Vietnamese. Ages: 7-10; Hardback. Swish, swish! They sewed. Tap, Tap! They hammered in the nails. Their little fingers worked so fast that the shoemaker could hardly believe his eyes... who are the secret helpers that come in the night? Grimm's classic tale is magically retold and richly illustrated by the award winning team that made Little Red Hen and the Grains of Wheat. Available in English with: Albanian, Arabic, Bengali, Chinese, Chinese-Simplified with Pinyin, English Only, Farsi, French, Lithuanian, Panjabi, Polish, Portuguese, Russian, Somali, Spanish, Tamil, Turkish, Urdu, Vietnamese. Ages: 4-8; Paperback. This traditional story is set in an inner city school where the children have grown an enormous turnip! How can they pull it out? First the boys try and then the girls but the turnip will not move. They all try together but the turnip still will not budge. Can Larry save the day? Available in English with: Albanian, Arabic, Bengali, Chinese, Czech, Farsi, French, German, Gujarati, Italian, Panjabi, Polish, Portuguese, Russian, Serbo-Croatian, Somali, Spanish, Tamil, Turkish, Urdu, Yoruba. Ages: 3-8; Paperback. Discover some of the world's best loved games and sports. Whether swimming in Nigeria, running in France, or camel racing in Dubai, children will be inspired to join in the action. This book is part of the "Our Lives, Our World" series, which explores the rich diversity of children's lives and develops a worldwide perspective. Other titles in the series include Brmmm! Let's Go! and Yum! Let's Eat! Available in English with: Arabic, Bengali, Traditional Chinese, Czech, French, Simplified Chinese, Polish, Portuguese, Russian, Spanish, Urdu. Ages 2-6; Paperback. "Stop Goldilocks, go back home! Woods aren't safe when you're all alone!" But Goldilocks doesn't listen to the warning, she just walks through the woods until she comes to the bears' house with steaming bowls of porridge. Wonderfully retold in a unique style with gorgeous cuddly illustrations. An irresistible addition to any collection. Available in English with: Albanian, Arabic, Bengali, Chinese, Czech, Farsi, French, German, Gujarati, Hindi, Italian, Panjabi, Polish, Portuguese, Russian, Serbo-Croatian, Somali, Spanish, Tamil, Turkish, Urdu, Vietnamese. Ages: 4-8; Paperback. This book includes two well known fables in one book wittily retold by Shaun Chatto and gloriously illustrated by Jago. Aesop�s The Goose that Laid the Golden Egg, set in a Europe of times gone by, explores humankind�s greed. By contrast, in the Buddhist fable Tortoise and the Geese, can the tortoise stop talking long enough to fly south with his friends the Geese Brothers? Available in English with: Arabic, Bengali, Chinese Simplified, Chinese Traditional, Farsi, French, Hebrew, Lithuanian, Polish, Portuguese, Russian, Slovakian, Somali, Spanish and Urdu. Ages: 4-9; Paperback. Handa puts seven delicious fruits in a basket to take to her friend, Akeyo. But on Handa's walk she passes a variety of animals who find the fruit very intriguing. When she arrives at her friend's village she finds... Children will enjoy following Handa on her journey through Eileen Browne's exuberant African landscape. Great for teaching and learning foreign languages and English as a Second Language - include in teaching units on fruits and animals. Available in English with: Albanian, Arabic, Bengali, Chinese, Farsi, French, Gujarati, Panjabi, Portuguese, Serbo-Croatian, Somali, Spanish, Tamil, Turkish, Twi, Urdu, Yoruba. Ages: 2-7; Paperback. Follow the magical adventure of a young boy who goes exploring with his friend, the Moon. I Took the Moon for a Walk combines lyrical verse with detailed illustrations, creating a dramatic backdrop for this imaginative journey. Readers will marvel at the serene beauty of the world at night. At the end of the story, readers can discover facts about the passage of the moon across the sky and its influence on our lives. There is also a page about nocturnal creatures. Available in English with: Albanian, Arabic, Bengali, Chinese-Simplified, Chinese-Traditional, Czech, Farsi, French, Haitian-Creole, Hindi, Irish, Lithuanian, Panjabi, Polish, Portuguese, Romanian, Russian, Slovakian, Somali, Spanish, Turkish, Urdu, Vietnamese, Welsh. Ages: 3-8; Paperback. The beloved King Osiris is murdered by his jealous brother Set and his casket thrown into the Nile. Queen Isis searches all over Egypt to find his body and set his spirit free. Osiris becomes ruler over the Land of the Dead where Egyptians longed to journey after they died. Isis and Osiris were the most popular of Egyptian deities. The Egyptian burial rites were based upon this story which describes how the first mummy was created. Available in English with: Albanian, Arabic, Bengali, Chinese-Traditional, Croatian, Farsi, French, German, Greek, Gujarati, Hindi, Italian, Panjabi, Polish, Portuguese, Russian, Somali, Spanish, Tamil, Turkish, Urdu, Vietnamese. Ages: 7-11; Paperback. When Cheetah decides he needs a friend who can run as fast as he can, Hippo is left in the dust. This is a tale about valuing your friends. It is a great starting point for exploring the nature of friendship with young children. Available in English with: Albanian, Arabic, Bengali, Chinese Simplified, Chinese Traditional, Czech, Farsi, French, Gujarati, Haitian Creole, Hindi, Hungarian, Irish, Kurdish, Lithuanian, Nepali, Panjabi, Polish, Portuguese, Romanian, Russian, Slovakian, Somali, Spanish, Turkish, Urdu, Vietnamese, Welsh. Ages: 2-7; Paperback. Take one little hungry girl, six different tempting foods and one shiny delicious red hot chilli. One big bite into the chilli results in a spectacular display of fireworks. Mom, dad, aunt and grandad all come to help but Lima's mouth is still too hot. Who can rescue her? Derek Brazell's artwork for this book was selected for the Best of British Illustration by the Association of Illustrators. Available in English with: Albanian, Arabic, Bengali, Chinese, Farsi, French, Greek, Gujarati, Japanese, Khmer, Korean, Panjabi, Polish, Portuguese, Somali, Spanish, Tamil, Turkish, Urdu, Vietnamese, Yoruba. Ages: 3-8; Paperback. This book contains two lovely fables children will enjoy. In Aesop's 'The Lion and the Mouse' Lion spares the life of the little mouse never thinking that one day the mouse might save his life. In the Tibetan fable 'The Hare's Revenge', Hare is fed up with the bullying Lion and finds a way to outwit him. Jan Ormerod's warm retelling and evocative illustration make Lion Fables a wonderful addition to any classroom. Available in English with: Albanian, Arabic, Bengali, Chinese, Chinese-Simplified with Pinyin, English Only, Farsi, French, Lithuanian, Panjabi, Polish, Portuguese, Russian, Somali, Spanish, Tamil, Turkish, Urdu, Vietnamese. Ages: 4-9; Paperback. It's nearly the New Year and Li can't figure out what animal he's going to be in the special school assembly. Will he be a fierce tiger or a strong ox? And what year will his new cousin be born in? Find each of the 12 zodiac animals on your way through the story and discover facts and activities relating to the festival at the back of the book. Available in English with: Arabic, Chinese-Traditional, Chinese-Simplified, French, Japanese, Polish, Spanish, Tagalog, Urdu and Vietnamese. Ages: 3-8; Paperback. Learn about the seasons and discover sights and sounds of nature-from summer's sizzling sun to winter's crunching snow. Available in English with: Albanian, Arabic, Bengali, Chinese Simplified, Chinese Traditional, Czech, Farsi, French, Gujarati, Haitian Creole, Hindi, Irish, Lithuanian, Panjabi, Polish, Portuguese, Romanian, Russian, Slovakian, Somali, Spanish, Turkish, Urdu, Vietnamese, Welsh. Ages: 2-5; Paperback. Winner of the UK National Literacy Association's Wow! Award 2006 (for best children's titles). Little Red Hen finds some grains of wheat but when she asks the cat, the dog and the goose to help her plant them, they are all too busy. When Little Red Hen has finally grown the wheat, harvested it, turned it into flour and baked it into bread the others are only to willing to help her eat it - but will she let them? The gentle repetition and humorous second story unfolding in the illustrations makes this a joyful retelling of the classic fable. Available in English with: Albanian, Arabic, Bengali, Bulgarian, Chinese, Chinese-Simplified, Croatian, Farsi, French, Greek, Gujarati, Hindi, Italian, Japanese, Korean, Kurdish, Panjabi, Polish, Portuguese, Russian, Shona, Somali, Spanish, Swahili, Tagalog, Tamil, Turkish, Urdu, Vietnamese, Yoruba Ages: 3-8 Paperback. It�s Christmas Eve and everyone is getting ready. But why does prababcia bring some hay and grandmother set an extra place at the table? Part of our "Celebration" series, this story explores the way people celebrate different festivals around the world. There are recipes and activities in this beautifully illustrated book that takes us to the heart of Christmas in Poland. Available in English with: Albanian, Arabic, Bulgarian, Croatian, Czech, French, Lithuanian, Polish, Portuguese, Romanian, Russian, Spanish, Urdu, Welsh. Ages: 3-8; Paperback. My daddy is a giant. When I want to cuddle him, I have to climb a ladder. He might sneeze like a hurricane and make the ground shake when he runs, but this daddy is a gentle giant. He loves his little boy with all his heart. A book for every little boy who knows he has the best daddy in the world. Available in English with: Albanian, Arabic, Bengali, Bulgarian, Chinese, Chinese-Simplified, Croatian, Farsi, French, German, Gujarati, Hindi, Irish, Italian, Japanese, Korean, Kurdish, Panjabi, Polish, Portuguese, Russian, Shona, Somali, Spanish, Tagalog, Tamil, Turkish, Twi, Urdu, Vietnamese, Yoruba. Ages: 1-5; Paperback and Hardback (depends on language). Nita breaks her leg and needs to be brave when she is taken to hospital. Chis Petty's beautifully made models in plasticine will help to ease children's fears and prepare them for their first hospital visit. Available in English with: Albanian, Arabic, Bengali, Bulgarian, Chinese, Chinese-Simplified, Farsi, French, German, Greek, Gujarati, Hindi, Italian, Japanese, Korean, Panjabi, Polish, Portuguese, Romanian, Russian, Spanish, Swahili, Tagalog, Tamil, Turkish, Twi, Urdu, Vietnamese, Yoruba. Ages: 4-8; Paperback. Little Red Riding Hood has ten cookies to take to her dad. On the way she meets some familiar, and hungry, characters. Rapunzel, the three bears, three billy goats. But as always there is a problem, a wolf is in the way. Will dad get any cookies? or will the wolf get there first! A clever story that links with famous tales and also works as a math counting book. Available in English with: Albanian, Arabic, Bengali, Chinese, Czech, Farsi, French, German, Gujarati, Hindi, Italian, Panjabi, Portuguese, Russian, Serbo-Croatian, Somali, Spanish, Tamil, Turkish, Urdu, Vietnamese. Ages: 3-8; Paperback. This famous Greek myth tells the story of the creation of life on earth and the loss of innocence. Pandora, created by Zeus, is given the gifts of the gods and sent to earth where Epimetheus falls in love with her. Zeus gives them a box which must not be opened. Pandora, having been given the gift of curiosity, opens the box and unleashes suffering into the world. This story is retold with stunning illustrations that progressively depict the forthcoming doom. Available in English with: Albanian, Arabic, Bengali, Chinese, Czech, Farsi, French, German, Greek, Gujarati, Italian, Panjabi, Polish, Portuguese, Serbo-Croatian, Somali, Spanish, Tamil, Turkish, Urdu, Vietnamese. Ages: 7-11; Paperback. Rats! Big rats, small rats, young rats and old rats! Enter a mysterious stranger... This sensitive retelling of the famous Pied Piper legend raises many moral and social issues as well as inspiring drama and music. Roland Dry's beautiful paintings capture the authentic atmosphere of time and place. Available in English with: Albanian, Arabic, Bengali, Chinese, Farsi, French, German, Gujarati, Hindi, Italian, Panjabi, Polish, Portuguese, Russian, Serbo-Croatian, Somali, Spanish, Tamil, Turkish, Urdu, Vietnamese. Ages: 4-8; Paperback. When Sahir loses a tooth, Dad arranges a visit to the dentist where he has a model made of his teeth. Yasmin has a small hole in a tooth, so goes to see the denstist as well. Both children learn valuable lessons about how to care for their teeth. Chris Petty's wonderful plasticine models bring a visit to the Dentist to life. Available in English with: Albanian, Arabic, Bengali, Chinese, Chinese-Simplified, Farsi, French, German, Greek, Gujarati, Hindi, Italian, Japanese, Kurdish, Panjabi, Polish, Portuguese, Russian, Somali, Spanish, Tagalog, Tamil, Turkish, Urdu, Vietnamese. Ages: 4-8; Paperback. The three billy goats need to cross the bridge to get to the fresh, green grass. But under the bridge lives a fierce and hungry Troll. The first goat tells the Troll to wait for his brother, who is much bigger than him. The second goat also tells the Troll to wait for his brother, who is much bigger than him. But when the third Billy Goat Gruff trip traps onto the bridge... Richard Johnson was awarded the Silver Medal in the 2001 Best of British Illustration Awards for the artwork in this book. Available in English with: Albanian, Arabic, Bengali, Chinese, Czech, Farsi, French, German, Gujarati, Italian, Panjabi, Portuguese, Serbo-Croatian, Somali, Spanish, Tamil, Turkish, Urdu. Ages: 3-8; Paperback. The first day at school is an enormous step for every child. Sofia is excited and can't wait to go to the big school like her sister. But Tom is worried: Will he get lost in the big school? Will he make any friends? Join Tom & Sofia in finding out about the fun and fears of the first few days in school. Available in English with: Albanian, Arabic, Bengali, Chinese-Traditional, Chinese-Simplified, Farsi, French, German, Greek, Gujarati, Hindi, Italian, Japanese, Kurdish, Malayalam, Panjabi, Polish, Portuguese, Russian, Somali, Spanish, Tagalog, Turkish, Urdu, Vietnamese. Ages: 4-8; Paperback. The caterpillar's journey from a little egg to a beautiful caterpillar is a timeless story adored by children. Eric Carle's all-time classic is available in dual-language editions, enabling the teacher to raise the language awareness of the whole class as they follow the evolution of the caterpillar in days, foods and numbers. Available in English with: Arabic, Bengali, Chinese, Gujarati, Panjabi, Somali, Urdu, Vietnamese. Ages: 1-5; Paperback. Join this fearless young explorer as she discovers the different animals and terrains in the world... and makes it home for supper, safe and sound! Available in English with: Albanian, Arabic, Bengali, Chinese, Czech, Farsi, French, German, Gujarati, Italian, Panjabi, Portuguese, Serbo-Croatian, Somali, Spanish, Tamil, Turkish, Urdu, Vietnamese. Ages: 2-5; Paperback. It's never easy going on a bear hunt, as five prospective hunters soon find out. On a beautiful day, four children and their dad cross a field of long grass, wade through a deep cold river, and head into a narrow cave. They say they're not scared... but what's that fearful creature looming up ahead? Available in English with: Albanian, Arabic, Bengali, Chinese, Czech, Farsi, French, Gujarati, Panjabi, Portuguese, Somali, Tamil, Turkish, Urdu, Vietnamese. Ages: 2-7; Paperback. The baby said, "Boo-hoo-hoo!" What are Cat, Dog, Cow and Duck to do? Feed him? Bathe him? Play with him? Will the Boo-Hoo Baby EVER stop crying? This award winning book, with gorgeous illustrations, will be instantly recognised by all tired parents and siblings who have been blessed with a new addition to their home. Available in English with: Albanian, Arabic, Bengali, Chinese, Czech, Farsi, French, German, Gujarati, Italian, Panjabi, Polish, Portuguese, Russian, Serbo-Croatian, Somali, Spanish, Tamil, Turkish, Vietnamese. Ages: 1-5;Paperback. This book invites you to sing along with this ever popular children's song. Each page has pre-cut holes for little fingers to find and play with...illustrations are fun, child-friendly and stimulate lots of conversation about the different feelings shown by the driver and his passengers. Available in English with: Arabic, Bengali, Chinese, Chinese-Simplified, Farsi, French, Gujarati, Panjabi, Portuguese, Somali, Spanish, Swahili, Tagalog, Turkish, Urdu. Ages: 0-3; Board Book. On Monday morning at two minutes past seven, Li got his first wobbly tooth. And his tooth went...Wibble Wobble. Li wibbles his tooth and he wobbles his tooth until... PLOP!! But what should Li do with the tooth? This funny story celebrates the diverse traditions associated with losing a tooth. From the author of the ever-popular Lima's Red Hot Chilli and Mei Ling's Hiccups, this 32-page book is great for a class discussion about shared experiences. Available in English with: Albanian, Arabic, Bengali, Chinese, Czech, Farsi, French, German, Gujarati, Hindi, Italian, Korean, Panjabi, Polish, Portuguese, Serbo-Croatian, Somali, Spanish, Tamil, Turkish, Urdu, Vietnamese Ages: 3-8; Paperback. The story of Yeh-hsien is believed to be the original telling of Cinderella. Yeh-hsien is raised by her stepmother who always gives her the hardest chores. Her only friend is a fish, which the wicked stepmother kills! The fish bones are magical, though, and they grant Yeh-hsien's wish to go to the village festival where she loses her slipper... Available in English with: Albanian, Arabic, Bengali, Chinese-Traditional, Chinese-Simplified, Farsi, French, Gujarati, Hindi, Japanese, Kurdish, Panjabi, Polish, Portuguese, Russian, Somali, Spanish, Tagalog, Tamil, Turkish, Urdu, Vietnamese. Ages: 4-8; Paperback. Meet children from around the world and explore their foods and eating traditions. Discover mouth-watering dishes including fajitas, sushi, dhal, roti and more! This book is part of the "Our Lives, Our World" series, which explores the rich diversity of children's lives and develops a worldwide perspective. Available in English with: Arabic, Bengali, Traditional Chinese, Czech, French, Simplified Chinese, Polish, Portuguese, Russian, Spanish, Urdu. Ages 2-6; Paperback.